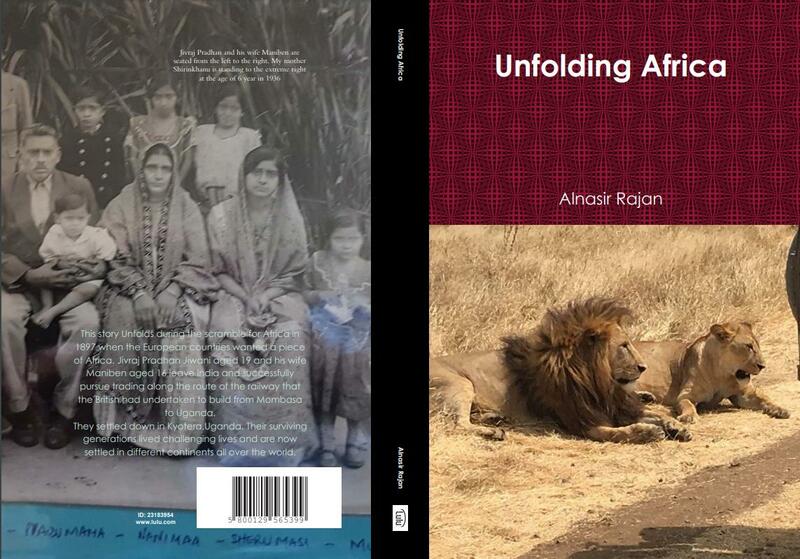 19 years old Jivraj Pradhan ventures into wild Africa in 1897 when the European countries were scrambling to get a piece of Africa. The British eventually ruled over the area while life struggles of challenges and survival continued for Jivraj. The man eating lions of Tsavo and the hostile tribes and the slave traders made life unpredictable for the local African population. Alidina Visram was a pioneer businessman who financed most of the local needs of the British Administration by paying all workers on the Railway route and supplying european goods to the Administrations. Jivraj moves to Uganda from Mombasa area and settles in Kyotera. Idi Amin follows decades later and turns the economy and infrastructure upside down. People are murdered for political gains and Jivraj Pradhan’s grandson fall prey to this and goes through the torture prisons. This is his story too. Real Characters Jivraj Pradhan, Maniben Nagji Mitha, Shirinkhanu Abdulkarim Rajan, Habib Jiwani, Sherbanu Jiwa, Abdulkarim Kassam Rajan. Would like to read the book. Jivraj Pradhan was my grandfather and Maniben was my grandma. They had a shop in Kyotera. I have good memories of them. The summer of 2018, I found myself in a small village called Jivapur about 20 km east of Jamnagar in the State of Gujarat in India with a population of about 4000. I was also very close to another small village called Dodhia where my paternal grandmother was born and later married my grandfather who brought her to Uganda after the First World War. It was, indeed, surreal to be so close to my ancestral home and actually meet a couple of my grandmother’s cousins who were excited to tell me stories of their childhood. But this was not the reason I was in Jivapur! An invitation from Munira Nagji, the founder and Director of Acts of Love to support her with her new project in Jivapur got me excited and with the support of my family, I found myself on the plane to Ahmedabad. I boarded a bus to Jamnagar on a 6 hours ride – quite comfortable, with AC and the latest Bollywood movie, “Sanju!” As the bus stopped at my destination, I noticed a colourful rickshaw packed with kids! Of course, I had never met Munira, but seeing her with these kids and a big welcoming smile on her face, I knew I had met my kindred spirit! The first thing I noticed was the children’s confidence and excellent Gujarati! It didn’t take me long to start chatting with them and they were quick to correct my Gujarati right away! Munira has a small, comfortable place with 2 bedrooms and a nice open veranda with a clean porch enclosed with an iron gate. The next 3 weeks were going to be routine with an alarm going off at 5 am and getting the children ready for school. After breakfast, we took them to the school bus. The students attended a non- government school from 7 am to 1 pm. While the students were at school, we spent the morning planning for the afternoon lessons in literacy and numeracy. In the afternoon, they had a hot lunch and began school homework followed by instruction in English and math. We also had made time to play together – badminton, volleyball and skipping. The children also loved to dance and sing beautiful songs in Gujarati. It was a very different assignment for me teaching and learning with 11 children (between 5 and 11 years old) who also slept at the house! One of their favourite times was “read aloud” before bed. Their favourite story was Titanic, however, they also thoroughly enjoyed Chicka Chicka Boom Boom, Brown Bear and Little Red Hen. They asked intelligent questions about the plot and characters and were excited to begin writing their own stories. In spite of the fact that Munira had to go to Calgary for 10 days for family emergency, we all survived pretty well. It was a huge responsibility especially when one of the children got sick at night or when the monsoons arrived suddenly and the rain poured down relentlessly so that our house had water everywhere! This was a unique and very rewarding experience for me. I am convinced that Munira has not only changed the lives of these children in Jivapur, but also their families. She has been able to break the cycle of degradation and give hope for a better future for them all, and I feel proud and privileged to have participated in their marvelous journey! Thank you for sharing your experience. You are truly blessed. You have a lot of Intellectual gifts to share in your journey to give back to the community in terms of time and knowledge. Congratulations Shamim.